Do you have neighbors that ignore fall leaf etiquette? You know, neighbors don’t rake THEIR leaves and wait for a windy day to blow all of their leaves into YOUR yard? Well, I have a fall leaf etiquette solution! the leaves from all sides. My biggest problems comes in that I live on a golf course – a blessing 10 months of the year. When fall rolls around the same people that they hire to mow their lawns all spring in summer on a daily basis go back to school and the golf course does very little in the way of landscaping. Breezes pick up and the leaves on the golf course quickly become my problem and I’m not even talking about a few bags, I’m talking dozens. I drove past a few of the construction sites around town and noticed those black tarp fences that are 2 feet high and stretched between common wood stakes about 10 feet apart. What were these black tarp tiny fences called that indicated borders on construction sites? They’re called “silt fences”. Silt fences are designed to keep construction debris on-site and from pouring over borders and into public streets etc… My questions were 1 – Are they easy to find? and 2 – Are they cheap? The answers are YES and YES. 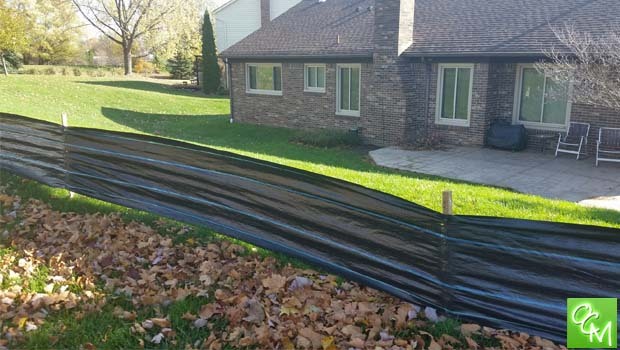 The silt fence has been great solution to the poor fall leaf etiquette of my pesky golf course neighbors. Silt fences are relatively cheap and extremely easy to install. I got my silt fence at bestbuy.com. I purchased over $100 feet of it for less than $25. The quality is horrible, but good enough. Just unroll the silt fence on your property lines and hammer in the stakes. The whole silt fence installation took just 10 minutes. I had to use a staple gun on windy days to re-staple the silt fence tarp to the stakes. My silt fence fall leaf etiquette solution does the trick. This year I’m raking my own leaves and no one else’s. I’ll take the fence down around Thanksgiving. It’s worth the 2 week eyesore in my yard not to have to rake and bag 25 plus yard bags of leaves.